SoloCare AQUA is a multi-purpose solution for cleaning, disinfecting, moisturising, and storing all types of soft contact lenses. It is suitable for sensitive eyes, and its patented Hydrolock technology ensures lasting moisture and comfort. Solocare Aqua is a unique, multipurpose solution designed to disinfect, moisturise, and store all types of soft contact lenses. It is very effective in cleaning lenses without rubbing them. 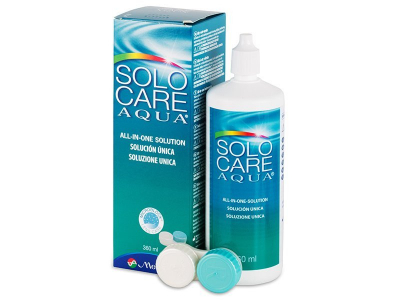 SoloCare Aqua solution uses efficient, gentle cleaning ingredients, making it suitable for contact lens wearers with sensitive eyes. This package contains one 360 ml bottle of solution and one antibacterial contact lens case. Hello there, I wonder if someone can tell me the difference between Solo care aqua vs Opti free solutions? Is one better suited for cleaning?